Roar your table to life with these exquisitely crafted Large Alligator Figures from Arthur Court. 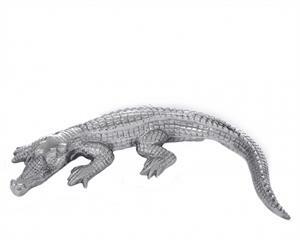 Patterns of scales display from the alligator's neck down the tip of its tail in lifelike fashion, while it opens its jaw wide in hungry anticipation. Handmade in sand-cast aluminum, these figurines complement drinkware and serveware nicely. Size: Length: 12.0" / Width: 5.5"